Miller Eccles Study Group Texas is thrilled to welcome Steven C. Harper as our April 2019 speaker. The accounts of Joseph Smith’s First Vision have been controversial from the beginning. In the years immediately following his theophany, Joseph Smith told his story to multiple audiences on multiple occasions, and he published two accounts of the First Vision while he was still alive. Several other documents and first-hand descriptions related to the First Vision have also been published. The many accounts of the First Vision have created fertile ground for historical investigation, especially by critics who have been unwilling to accept the faith claims inherent in the Prophet Joseph’s story. The criticisms have been so persistent that The Church of Jesus Christ of Latter-day Saints decided in 2013 to publish an essay explaining how variances among the accounts can be reconciled. 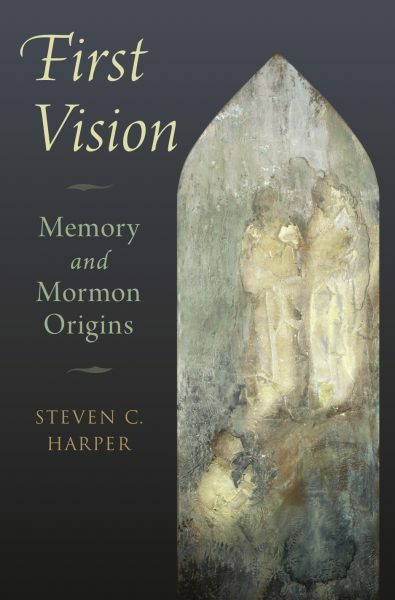 Steven C. Harper is the leading historian of the First Vision, having published numerous articles on the topic, as well as two books: Joseph Smith’s First Vision (Deseret Book, 2012), and the forthcoming First Vision: Memory and Mormon Origins (Oxford University Press, 2019). His study group presentations on April 12 and 13 will include some of the research findings contained in his forthcoming book. Steve was also the editor, managing historian, and one of the authors of, Saints, volume 1. He will offer six reasons why Latter-day Saints need Saints at a devotional fireside in Arlington on April 14. Please join us for these informative presentations. To a nerdy historian like Steve Harper, the best thing about the Harry Potter stories is the pensieve, the magical bowl of memories in which an observer can sift through another person’s past. Steve’s talk will be the closest thing to looking in the pensieve at Joseph Smith’s memories of his first vision. It has become common to account for variety in Joseph’s first vision accounts by saying he intended them for different audiences. However true that may be, it’s not the best explanation. Steve will provide a better one based on intimate knowledge of all the vision accounts in light of what we now know about the way memories form and get recalled. Are you one of the 340,000 people who has a print copy of Saints in one of fourteen languages? Are you one of the 834,000 people who have installed Saints in your Gospel Library app and read or listened to a combined 80 million chapters so far this year? Would you like to learn more about where Saints came from and hear six reasons why Latter-day Saints need Saints? Steve Harper was a general editor, the managing historian, and one of the writers. He’ll speak to us about what he learned along the way and what it feels like to lose your memory. Steven C. Harper is a professor of Church history and doctrine at Brigham Young University. In 2012 Steve was appointed as the managing historian and a general editor of Saints: The Story of the Church of Jesus Christ in the Latter Days. 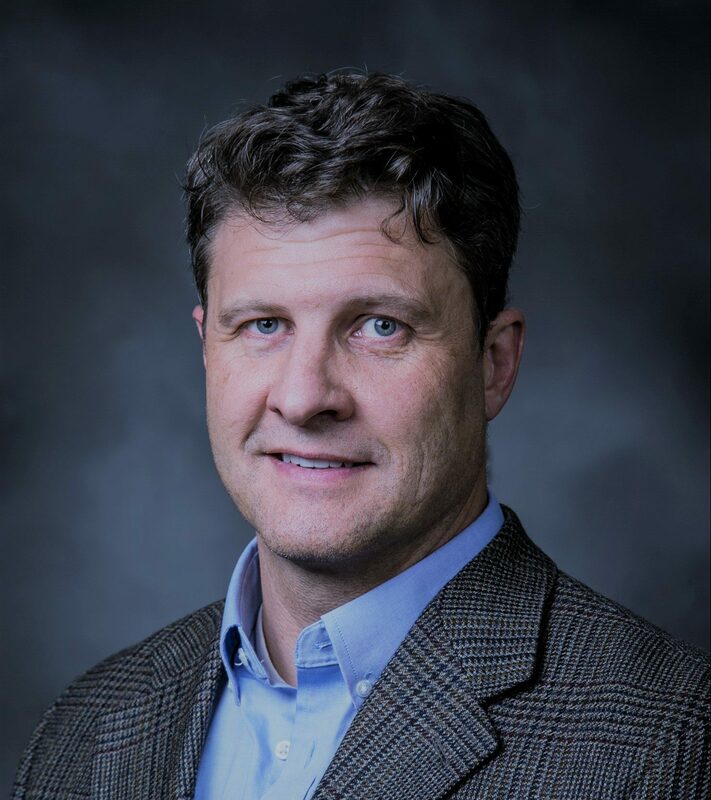 He was named editor in chief of BYU Studies Quarterly in September 2018. He earned an MA in American history from Utah State University and a PhD in early American history from Lehigh University in Bethlehem, Pennsylvania. He began teaching courses in religion and history at BYU Hawaii in 2000 and joined the Religious Education faculty at BYU in 2002. That year he also became a volume editor of The Joseph Smith Papers and the document editor for BYU Studies. He taught at the BYU Jerusalem Center for Near Eastern Studies in 2011–2012. His first book was Promised Land (Lehigh University Press, 2006), a study of Lenape or Delaware Indians’ responses to a fraudulent 1737 land deal in colonial Pennsylvania. He also authored Making Sense of the Doctrine and Covenants (Deseret Book, 2008), Joseph Smith’s First Vision (Deseret Book, 2012), and First Vision: Memory and Mormon Origins (Oxford University Press, 2019), along with dozens of articles. 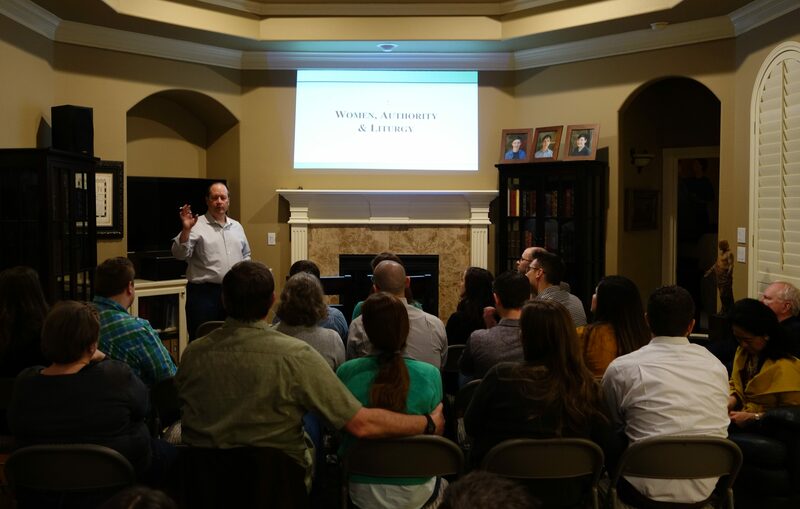 Miller Eccles Study Group Texas was pleased to host Jonathan Stapley at study group meetings in McKinney on January 25, 2019, and in Arlington, on January 26, 2019. His topic was “Women, Liturgy, Authority” and was based on the findings contained in his 2018 book The Power of Godliness: Mormon Liturgy and Cosmology. 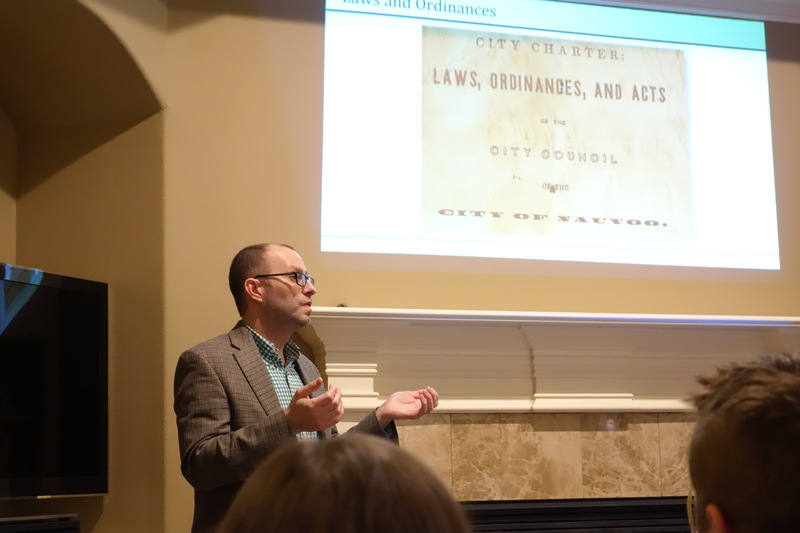 Jonathan Stapley speaks to attendees of Miller Eccles Study Group Texas on January 25, 2019, in McKinney, Texas. 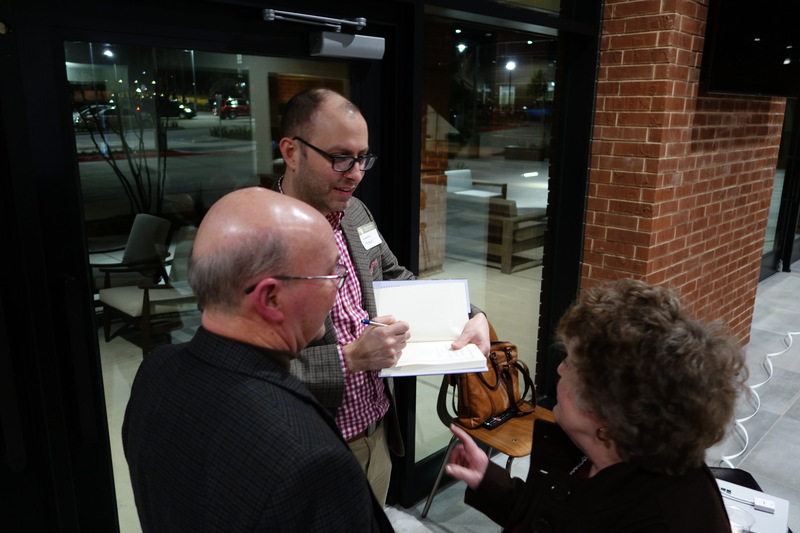 Jonathan Stapley signs a copy of his book “The Power of Godliness: Mormon Liturgy and Cosmology” at the Miller Eccles Study Group Texas event in McKinney, Texas, on January 25, 2019. 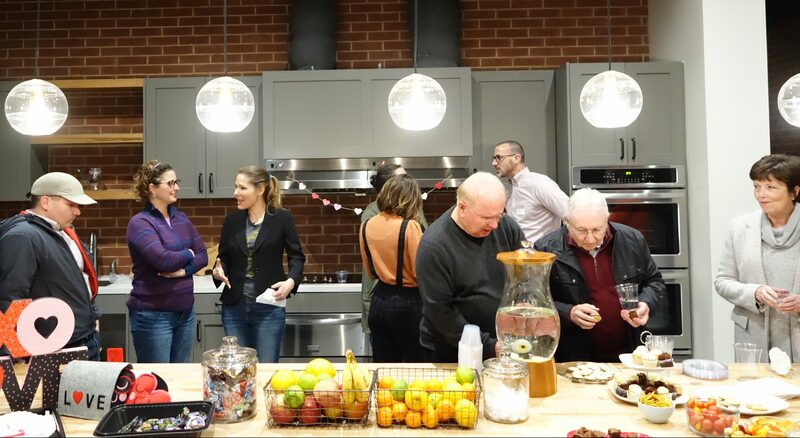 Miller Eccles Study Group Texas participants visit with each other and enjoy refreshments after Jonathan Stapley’s presentation in McKinney, Texas, on January 25, 2019. Cris Baird welcomes Miller Eccles Study Group attendees to Jonathan Stapley’s presentation in Arlington, Texas, on January 26, 2019. Jonathan Stapley speaks to Miller Eccles Study Group attendees in Arlington, Texas, on January 26, 2019. 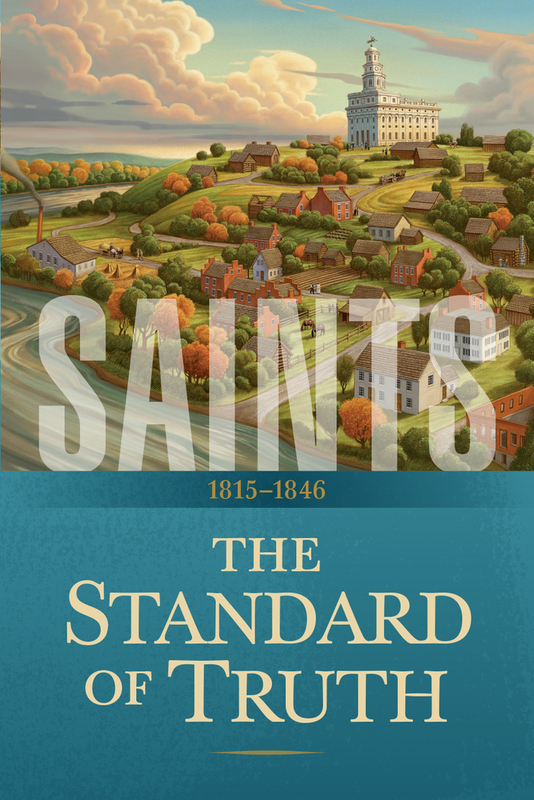 The history of Latter-day Saint ordinances is fascinating, and thanks to the excellent work of Jonathan Stapley, has recently become much more accessible. In early 2018, Oxford University Press published Stapley’s landmark work The Power of Godliness: Mormon Liturgy and Cosmology. We hope you’ll join us to learn more about The Power of Godliness. Mormon conceptions of priesthood, gender, and authority are of intense social interest, but have proved challenging to understand for both scholars and believers alike. In this presentation, Stapley will share several key findings from his book that connects the present to the past in comprehensible ways. From the priesthood language of the Nauvoo Temple to the diverse liturgy of the church, Stapley will discuss the ways in which members of The Church of Jesus Christ of Latter-day Saints order their universe. Jonathan Stapley is an award-winning historian, scientist, and Chief Technology Officer of a company he founded. Oxford University Press published his volume, The Power of Godliness in early 2018. Stapley received his Ph.D. from Purdue University and has been active in the field of Mormon History for over a decade. He also writes for the academic history Juvenile Instructor blog, and at By Common Consent, a Mormon blog. 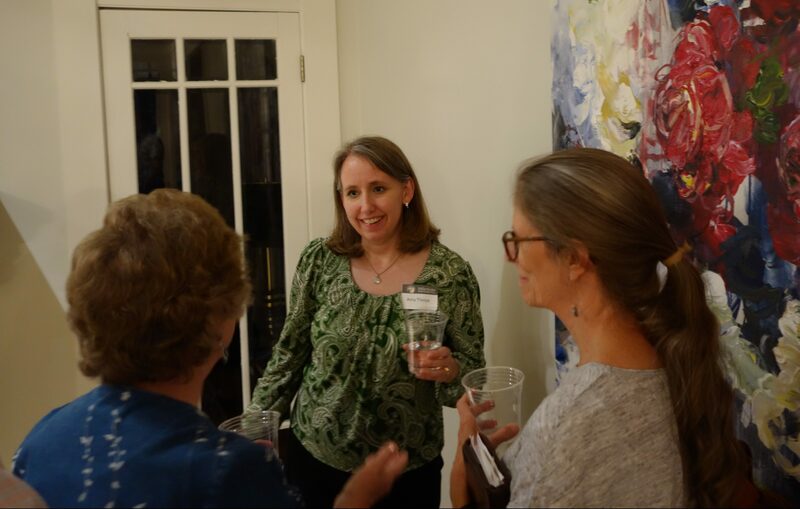 Miller Eccles Study Group Texas was pleased to host Jenny Reeder at study group meetings in McKinney on Friday, October 19, 2018, and in Arlington on Saturday, October 20, 2018, and at a fireside in Arlington on Sunday, October 21, 2018. Her study group topic was “To Expound Scripture and Exhort the Church: Women Behind the Pulpit”. Her fireside topic was “Fire In My Bones: Women’s Stories from the Church Historian’s Press”. Jenny Reeder speaks to Miller Eccles Study Group participants at a study group meeting in McKinney, Texas, on October 19, 2018. 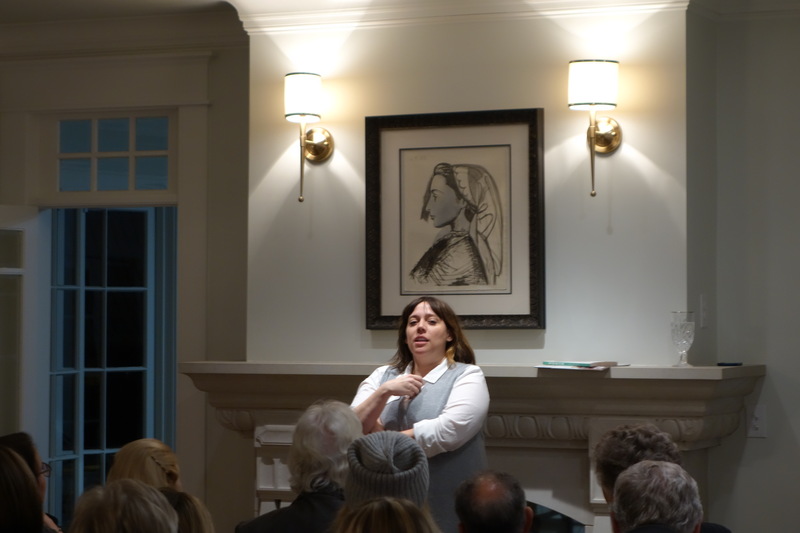 Jenny Reeder speaks to attendees of Miller Eccles Study Group Texas at a study group meeting in Arlington, Texas, on October 20, 2018. Jenny Reeder’s presentation included highlights from the sermons included in “At the Pulpit: 185 Years of Discourses by Latter-Day Saint Women” published by The Church Historian’s Press. Miller Eccles Study Group Texas participants enjoy Jenny Reeder’s Presentation in Arlington Texas, on October 20, 2018. 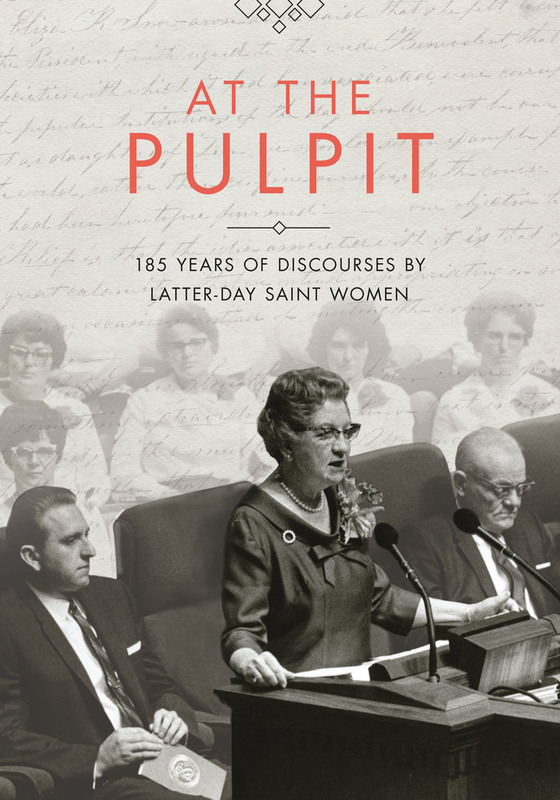 In the few months since its 2017 publication, At the Pulpit: 185 Years of Discourses of Latter-day Saint Women has assumed a significant role in the recovery and access to Mormon women’s discourse. A publication of The Church Historian’s Press, At the Pulpit is available in print, for free online, and in the LDS Library app. In an effort to reach a larger portion of the Church’s worldwide membership, the book has even been translated into Spanish and Portuguese. Please join us for a wonderful evening (or two!) as Jenny Reeder tells the story of Mormon women At the Pulpit. “Let your women keep silence in the churches: for it is not permitted unto them to speak.” (1 Cor. 14:34). 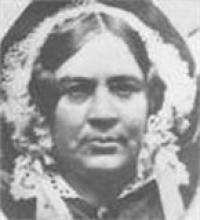 In early July 1830, Emma Hale Smith received a revelation dictated through her husband, Joseph Smith, about her role in the new Church of Christ. Drawing on New Testament language, he described the office of her specific assignment as an “elect lady . . . to expound scriptures, and to exhort the church, according as it shall be given thee by my Spirit.” Smith concluded the directive with a more general invitation: “this is my voice unto all.” (D&C 25:3, 16). From that time, Mormon women developed a robust tradition of public speaking. Amid the contentious atmosphere of American religious women both speaking and being silenced, Mormon women spoke. Their words strengthened each other, influenced the larger Latter-day Saint community, and forged collaborative relationships with others in both religious and civic associations. In this presentation, Jenny Reeder will talk about the charge to speak; the process of selecting sermons and writing the book; and the role of women in contributing to Latter-day Saint discourse. Women have been and continue to be a key part of the Restoration. They spoke, testified, expounded and exhorted. Their stories and experiences provide both scholarly information and devotional inspiration, demonstrating their institutional authority and how they lived their religion. The well-being of women is crucial to the success of the Church of Jesus Christ of Latter-day Saints. We read their stories to know we are not alone. Jenny Reeder is the 19th-century women’s history specialist at the Church of Jesus Christ of Latter-day Saints Church History Department. She currently works on the web team, where she has authored several History Topics essays to accompany Saints, vols. 1 and 2. She has edited two books: At the Pulpit: 185 Years of Discourses by Latter-day Saint Women with Kate Holbrook at the Church Historian’s Press, and Witness of Women: Firsthand Experiences and Testimonies of the Restoration with Janiece Johnson at Deseret Book. Jenny has written chapters in edited collections such as Foundational Texts of Mormonism: Examining Major Early Sources (Oxford Press, 2018), Immediate Present (Mormon Arts Center, 2017), Women and Mormonism: Historical and Contemporary Perspectives (University of Utah, 2016), and Women of Faith in the Latter Days, vol. 1 & 2 (Deseret Book, 2011 & 2012). 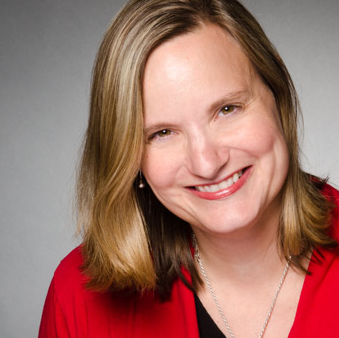 Jenny earned a PhD in American History at George Mason University, emphasizing women’s history, religious history, memory, and material culture. She has an MA from New York University in history, archival management, and documentary editing. She speaks at Time Out for Women. Miller Eccles Study Group Texas was pleased to host Amy Tanner Thiriot at study group meetings in McKinney on Friday, July 20, 2018, and in Arlington on Saturday, July 21, 2018, and at a fireside in Arlington on Sunday, July 22, 2018. Her study group topic was “Go Down Moses: The Black Mormon Pioneer Experience”. 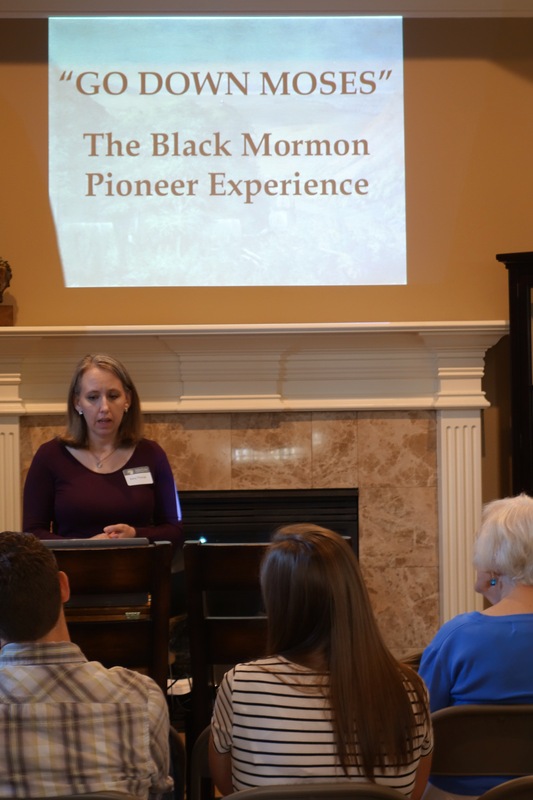 Her fireside topic was “In My Father’s House Are Many Mansions: The Black Mormon Pioneer Experience”. Amy Tanner Thiriot speaks to Miller Eccles Study Group Texas attendees at a study group meeting in McKinney on July 20, 2018. Amy Tanner Thiriot during her presentation in McKinney on July 20, 2018. Amy Tanner Thiriot visits with study group attendees following her presentation in McKinney on July 20, 2018. Amy Tanner Thiriot begins her remarks to Miller Eccles Study Group Texas at a study group meeting in Arlington on July 21, 2018. 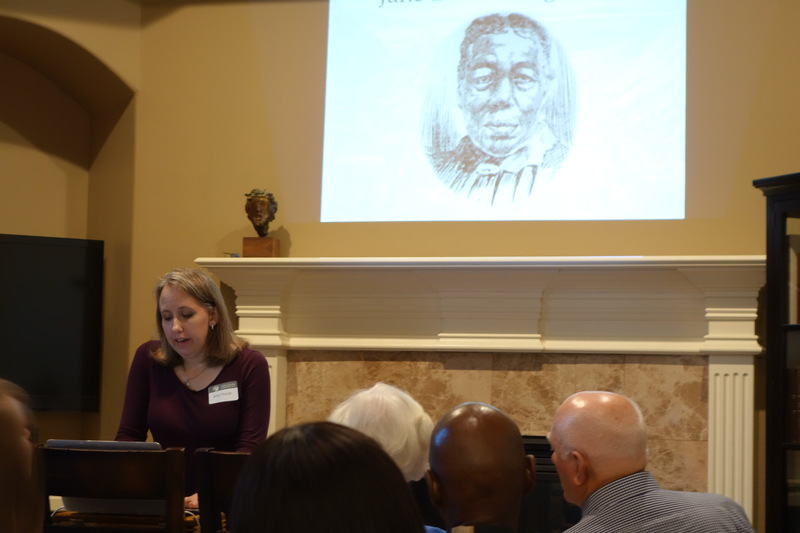 Amy Tanner Thiriot displays an image of Jane Manning James while speaking to Miller Eccles Study Group Texas attendees in Arlington on July 21, 2018. You may have heard about Jane Manning James and her desire to receive the blessings of the temple. If you’ve been reading the most current historical research, you might even be familiar with the story of Green Flake. But can you name any of our other black pioneers? Amy Tanner Thiriot can name several. That’s why Miller Eccles Study Group Texas is thrilled to welcome Amy Tanner Thiriot as our July 2018 speaker. Coming soon on the heels of the Church-sponsored celebration of the 40th anniversary of the 1978 revelation ending the priesthood and temple restriction affecting Church members of African descent, there’s no better time to learn more about our black pioneers. So, we hope you’ll join us for a pioneer day commemoration event like none you have participated in before. Members of the Church of Jesus Christ of Latter-day Saints may have become familiar with the names of Jane Manning James, Green Flake, and a few other early free or enslaved black members of the Church but might not be aware of the extent of black history in the Church. 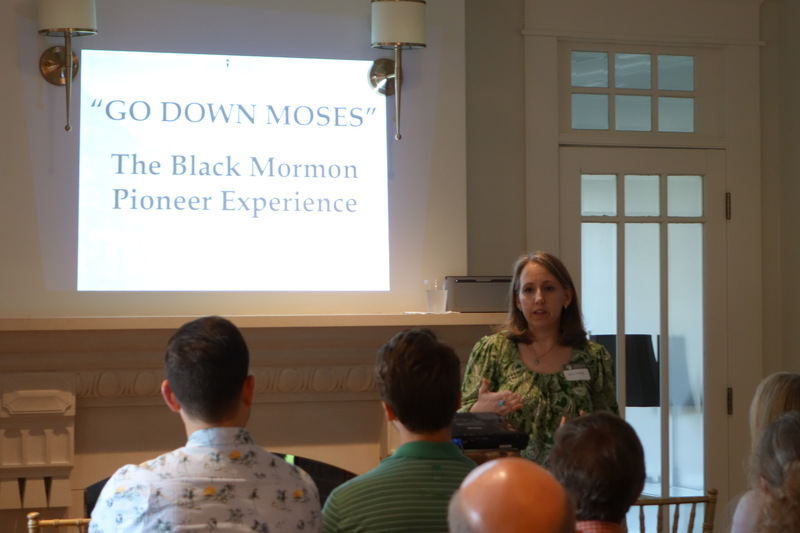 Join us as historian Amy Tanner Thiriot shares the stories of many early black Latter-day Saints, and also shares some of the stories behind the stories. Why were Jane Manning James and her family arrested in Illinois? How did Texas converts and their slaves help settle early Utah? How does the story of a Texas slave patrol tie into the story of the 1978 revelation on the Priesthood? What role did free and enslaved African Americans play in the settlement of Utah and the American West? What do the lives of the early black members of the Church tell us about the history of America and Mormonism? How were their stories forgotten—or in some cases erased—and how can we remember them now? Jane James. Courtesy Church History Library. The first black members of the Church of Jesus Christ of Latter-day Saints were a vital part of the early history of the Church. They served missions and shared the gospel. As the Church moved west, they helped build Nauvoo and Winter Quarters and drove wagons across the plains to the Salt Lake Valley. Once in Utah, they helped rescue the stranded handcart companies, built roads and communities, and raised families in the Mormon settlements in the West. Many of them experienced great tragedies and losses, but they lived lives of service and built a strong heritage of faith for their descendants and the Church. Join us for an evening of inspiring stories of early Latter-day Saints including Green Flake, Jane Manning James, Venus Redd, Samuel and Amanda Chambers, Thomas Bankhead Coleman, and many others. Green Flake. Courtesy Salt Lake Tribune Archives. Independent family and community historian Amy Tanner Thiriot specializes in the stories of the lesser-known early members of the LDS Church. Her ongoing series, “The Eminent Women of the St. George Temple” at Keepapitchin: The Mormon History Blog, prompted her work on the stories of the little-known black pioneers. She recently finished a manuscript about the experiences of the enslaved African American pioneers of Utah Territory. She blogs at TheAncestorFilesand Genealogy’s Star. Thiriot lives in Pennsylvania with her husband David. They are the parents of five children. She served in the Germany Düsseldorf Mission and currently serves as ward organist and director of the local Family History Center. 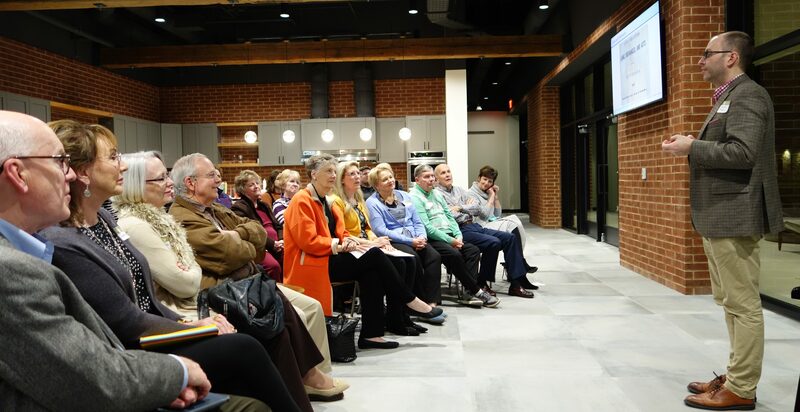 Miller Eccles Study Group Texas was pleased to host Jana Riess at study group meetings in McKinney on Friday, May 18, 2018, and in Arlington on Saturday, May 19, 2018. Her topic was “Millennial Mormons: The Rising Generation of Latter-day Saints”. Adam Miller introduces Jana Riess at a Miller Eccles Study Group Texas meeting in McKinney, Texas, on May 18, 2018. 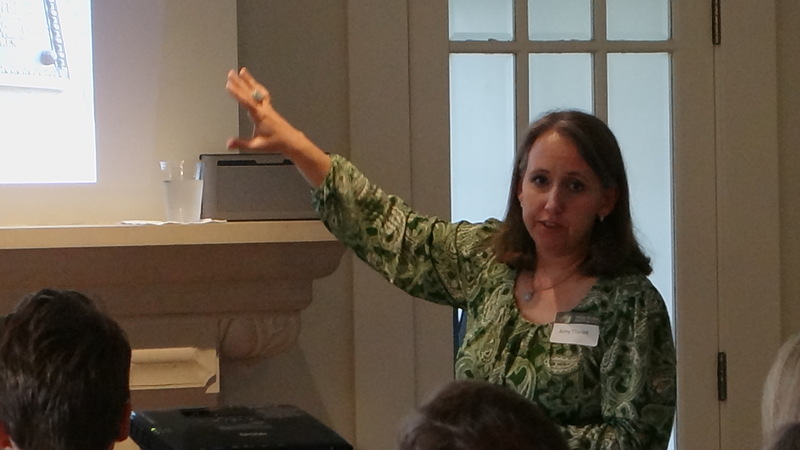 Jana Riess speaks to attendees of Miller Eccles Study Group Texas at a study group meeting in McKinney, Texas, on May 18, 2018. Jana Riess visits with a Miller Eccles Study Group Texas attendee after her presentation in McKinney, Texas, on May 18, 2018. Janae Riess speaks at a Miller Eccles Study Group Texas meeting in Arlington, Texas, on May 19, 2018. Jana Riess explains findings from her research at a Miller Eccles Study Group Texas meeting in Arlington, Texas, on May 19, 2018. Miller Eccles Study Group Texas is thrilled to welcome Dr. Jana Riess as our May 2018 speaker. 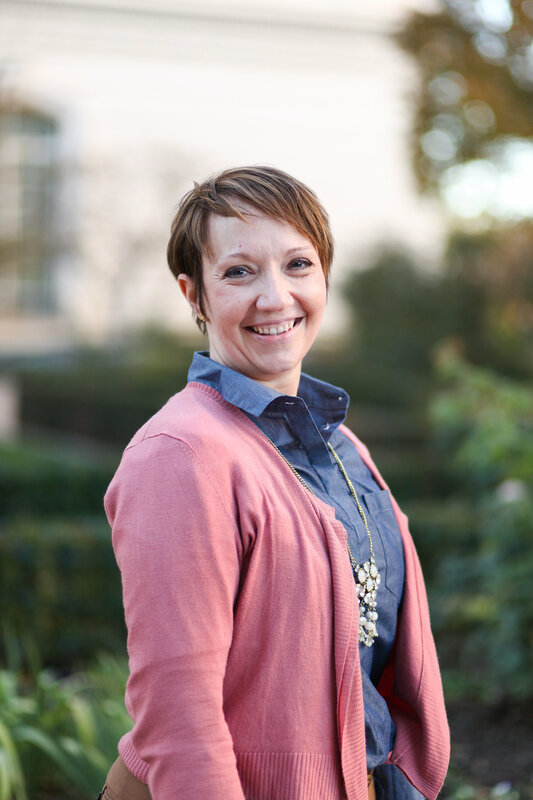 Jana is the author of a forthcoming book titled Millennial Mormons: The Rising Generation of Latter-day Saints (Oxford University Press, 2019), which is based on extensive surveying conducted by Jana and Benjamin Knoll. You’re likely familiar with Jana’s writing for Religion News Service and her frequent media appearances where she provides commentary on issues relevant to current-day Mormonism and its culture. We hope you’ll join us as she describes how demographic changes are likely to influence the future of Mormonism. How do young adult Mormons — the “Millennials” — differ politically from older Mormons, and how do they relate to authority? Research from the Next Mormons Survey (2016) indicates that young Mormons are less likely to vote Republican or adopt conservative positions than older Mormons, but more likely to do so than non-Mormons their own age. 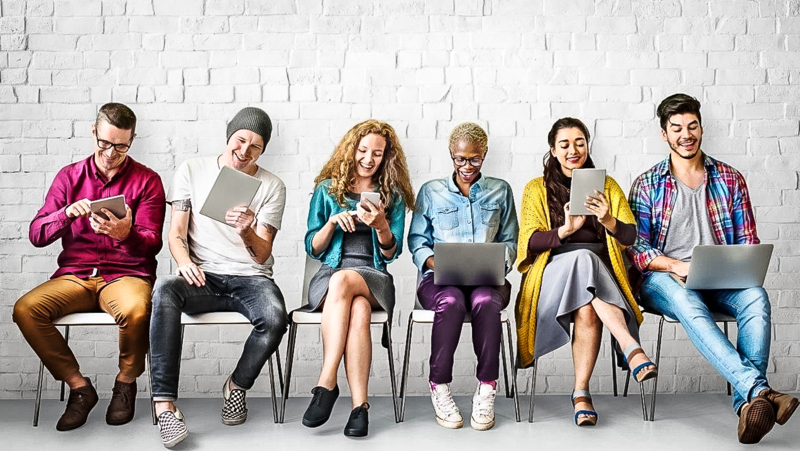 They also show a somewhat weakened relationship to institutional authority and obedience than older Mormons but are more responsive to authority than non-Mormon Millennials. Jana will discuss how Mormon Millennials are caught between competing ideals and what that means for the future practice of Mormonism. They’re part of a generation that is the least religious in modern recorded history, but they’re part of a religion that is demanding and rigorous. How they will reconcile these competing ideals tells us a good deal about where Mormonism might be heading into the 21st century. Before writing Millennial Mormons, Jana Riess authored a number of books, including Flunking Sainthood: A Year of Breaking the Sabbath, Forgetting to Pray, and Still Loving My Neighbor, which was selected as one of the top ten religion books of 2011 by Publishers Weekly. Her most recent book is The Prayer Wheel: A Daily Guide to Renewing Your Faith with a Rediscovered Spiritual Practice. She is a senior columnist for Religion News Service and is often quoted in national news and magazine articles on Mormon issues. Although she was never able to climb the rope in gym class, she has a Doctorate in American religious history from Columbia University. Jana lives in Cincinnati with her husband and daughter, who are both Episcopalians, and together they navigate the waters of being a Mormopalian family. This means that they light Advent candles early and often, but hide any evidence that wine is ever used in cooking. Jana is obsessed with travel and also loves reading, yoga, dogs, and did we mention travel? She is a Relief Society teacher in her ward and a stake Self-Reliance facilitator in the Cincinnati Ohio Stake. 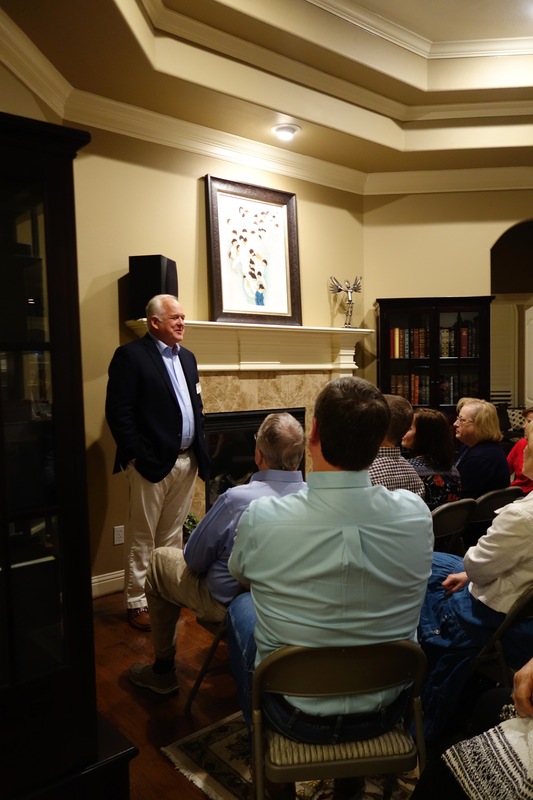 Miller Eccles Study Group Texas was pleased to host Tom Christofferson at study group meetings in McKinney on Friday, February 16, 2018, and in Arlington on Saturday, February 17, 2018. His topic was “That We May Be One: A Gay Mormon’s Perspective on Faith & Family”. Katy Bettner introduces Tom Christofferson at a meeting of Miller Eccles Study Group Texas in McKinney on February 16, 2018. 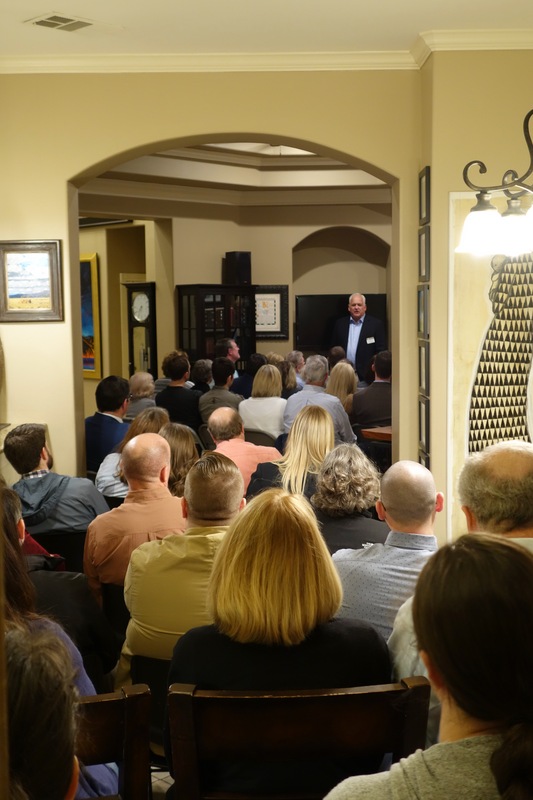 Tom Christofferson speaks to attendees of Miller Eccles Study Group Texas at a study group meeting in McKinney on February 16, 2018. 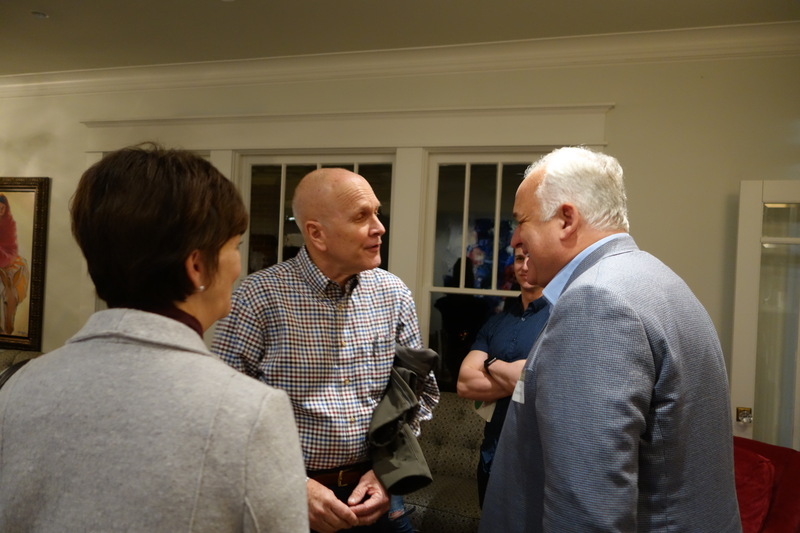 Tom Christofferson visits with attendees of Miller Eccles Study Group Texas at a meeting in McKinney on February 16, 2018. 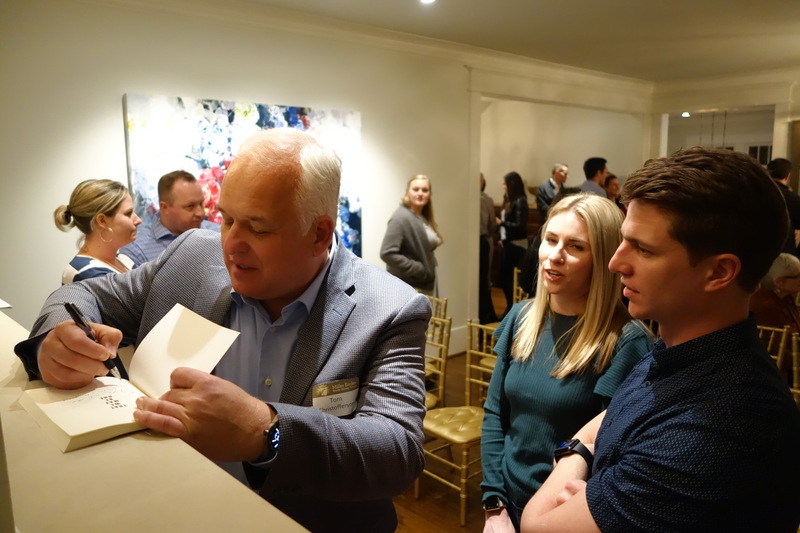 Tom Christofferson autographs a copy of his book at a meeting of Miller Eccles Study Group Texas in McKinney, on February 16, 2018. Tom Christofferson speaks to attendees of Miller Eccles Study Group Texas in Arlington, Texas, on February 17, 2018. 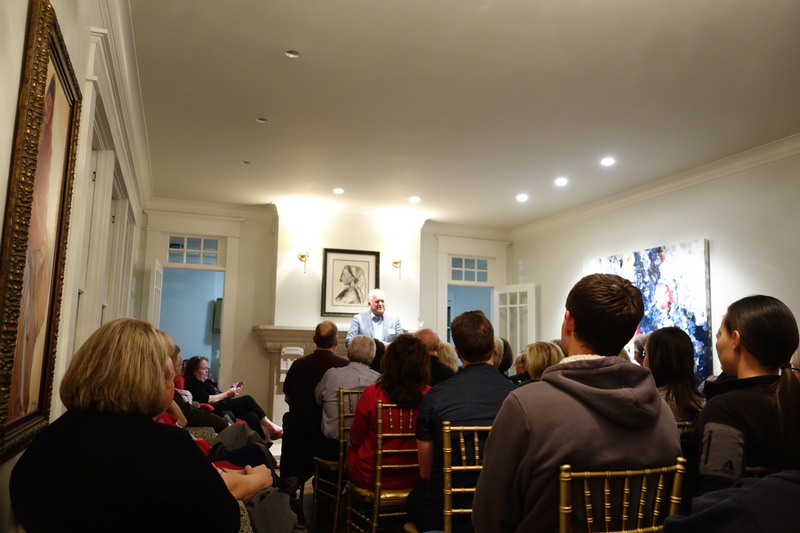 Tom Christofferson speaks to Miller Eccles Study Group Texas at a study group meeting in Arlington, Texas, on February 17, 2018.